For the ultimate in comfort and support, choose a Drag Specialties seat featuring an EZ GLIDE backrest or backrest option. The exclusive design simply plugs into the seat and easily adjusts to fit you perfectly. With several EZ GLIDE models to choose from, comfort and support is just a click away. 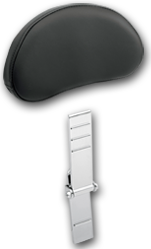 All EZ GLIDE backrests feature a contoured base and solar-reflective leather to keep them cool even in direct sunlight. 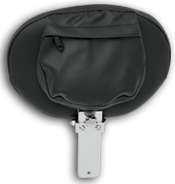 EZ GLIDE I OR EZ GLIDE II Backrest with Large Pad and integrated rain cover. the entire seat. 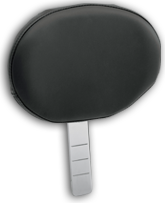 Pad measures 10" W x 7 1/2" H.
Available in three styles, these EZ GLIDE backrests are easily added to select Touring Models with OEM Seats.